Polling began today in Tamil Nadu, Kerala and Puducherry after witnessing a high-octane campaign between AIADMK-DMK and LDF-UDF. Millions voted on Monday in Kerala, Tamil Nadu and Puducherry, bringing down the curtains on staggered five-state elections — the biggest popularity test since the Lok Sabha battle. Some 40 million voted in Tamil Nadu, which saw multiple contests in all constituencies for the first time, and about 18 million in Kerala, where the BJP made determined efforts to make inroads in a state dominated by the Congress-led UDF and the LDF headed by the CPI-M. The polling percentage in Kerala — which elects a 140-seat assembly — was 70.35 at 5 p.m. Election Commission officials said it could well cross the 75.12 per cent recorded in 2011 when the polling ends at 6 p.m.
# An estimated voter turnout of 71.7% was recorded in Kerala. # 69.19% voters turnout recorded till 5 PM in Tamil Nadu Election. # Picking up pace rapidly, the Union Territory of Puducherry recorded 71.08 per cent voting till about 4 PM. # A 54-year old polling officer died of a massive heart attack in a booth in Kangeyam Assembly constituency while two elderly voters in Madurai and Sivaganga collapsed and died near polling booths in Tamil Nadu, police said. 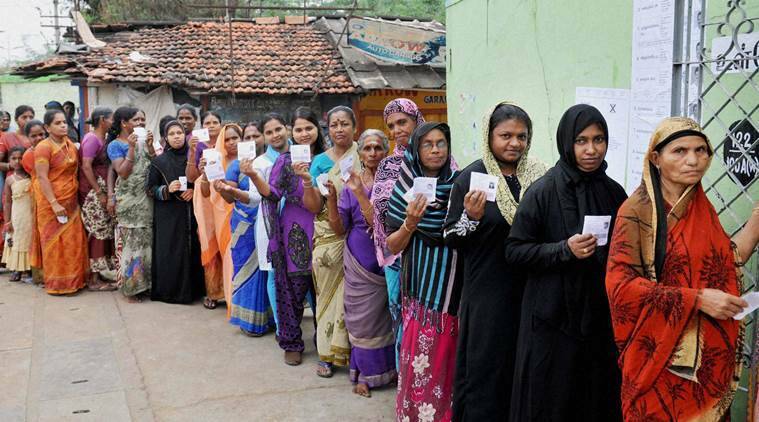 #Election authorities in Tamil Nadu have made a recommendation to the Election Commission to extend time to vote in rain hit regions of Tamil Nadu following representations from AIADMK, DMK and Congress. # 8 districts witnessing heavy rain. Have recommended to extend poll time, expecting ECI nod by 3pm: Rajesh Lahoni, Chief Electoral Officer of TN. # 42.1% voter turnout recorded till 1 PM in Tamil Nadu Election, 45% voter in Kerala. # 30% voters turnout recorded till 11 AM in Kerala Polls. # 25.2% voters turnout recorded till 11 AM in Tamil Nadu elections. # 13.5% voter turnout recorded till 9:30 am in Kerala. # Tamil Nadu Assembly polls: Polling percentage of 18.3% recorded till 9 am. # Despite the hectic campaign of the Prime Minister, BJP will not be able to open account in Kerala assembly: AK Antony. Urging all voters in Tamil Nadu, Kerala and Puducherry to vote in record numbers today & be a part of this festival of democracy.